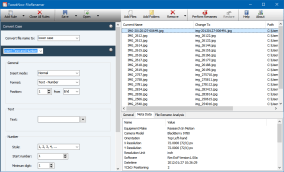 TweakNow FileRenamer is a simple but the most advanced file renamer utility in the market. Designing with user in mind, the program enable you to perform a complex renaming task easily. 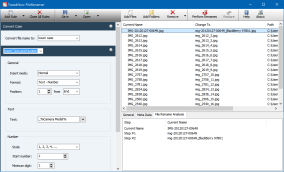 Adding, removing, inserting, indexing, or replacing characters and numbers can be done swiftly. 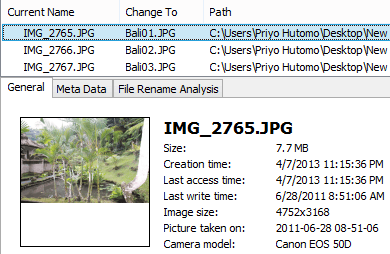 If you're a photographer with thousands of imported photos from camera, you will appreciate how this program can easily turn those IMG* files to a more meaningful name. Just try it, you'll see how this little program can save a lot of your time and effort. Search for word and replace it with other. You can also use a regular expression syntax for a complex find and replace task. Add text and number to a certain position in file name. 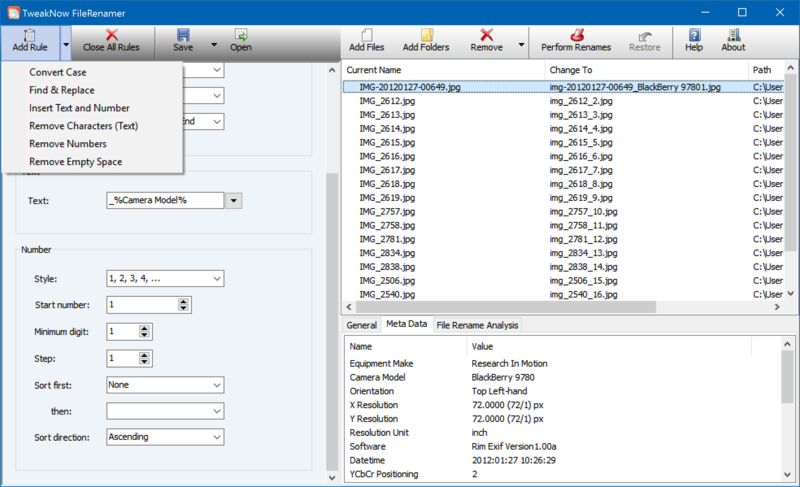 When available, meta data (shooting date and time, camera mode, etc.) can be automatically inserted to file name. There are three insert mode that can be used: normal, overwrite, replace. Remove characters (text) at a certain position in file name. The remove operation can be performed forward or backward. Remove number at a certain position in file name. The remove operation can be performed forward or backward. Remove empty space from file name. Suddenly changing your mind after permanently renaming the files? Don't worry. 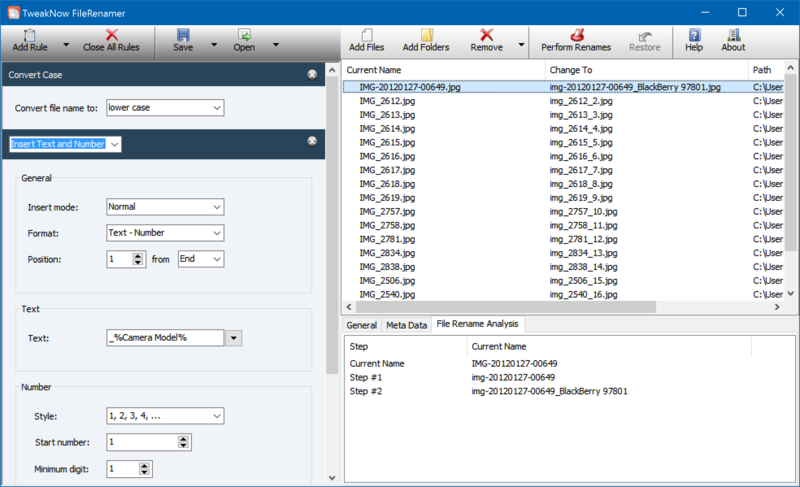 TweakNow FileRenamer include an Undo feature to revert your previous action. To avoid mistake, all proposed changes can be seen directly in the file list section. 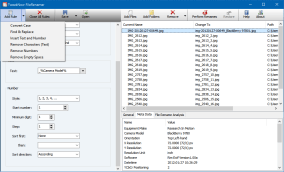 If you need more detail information, go to the File Rename Analysis tab page to see result for each step on multi rules file renaming operations. Wish to automatically add the date when a photo was taken or artist name into file name? No problem. 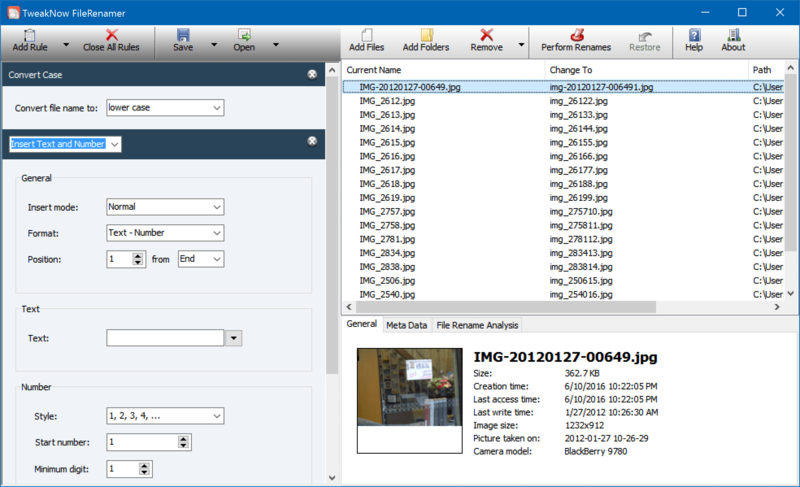 TweakNow FileRenamer can read data from EXIF and ID3 tags and use them in the insert and sort operation. Need to rename files with the same rules over time? No need to waste your time adding and re-configuring the same rules over and over again. 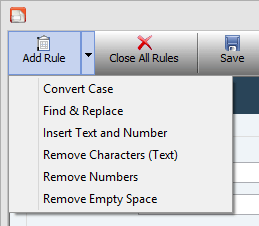 TweakNow FileRenamer provides feature to save rules to a file for future use.